It may come as no surprise that family law cases, and especially divorce proceedings, sometimes bring out the least favorable qualities in the parties involved. Part of this is due to the nature of divorce, which happens when the couple is separating and choosing to live apart. In an ideal situation, spouses work together to resolve these issues efficiently and amicably so that they both can move forward in their lives. In cases in which one or both parties acts in a manner that frustrates the litigation of legal issues to be resolved, family courts have the authority to impose sanctions as a “tool” to reduce these unnecessary delays. One of the best ways to ensure that your case moves along as efficiently and amicably as possible is to consult with an experienced family law attorney from the local San Diego area. Under Section 271 of the California Code, “courts may base an award of attorney’s fees and costs on the extent to which the conduct of each party or attorney furthers or frustrates the policy of the law to promote settlement of litigation . . .” In a recent California divorce case, the court reviewed the husband’s appeal, in which he claimed (among other things) that the trial court should not have sanctioned him $7,500 because the wife failed to give proper notice of sanctions, and there was insufficient evidence of the purported misconduct that allegedly gave rise to the award. Here, the parties were married in 1984, and the wife filed for divorce in 2012. Among other demands, the wife sought sanctions, citing only the husband’s purported refusal to provide a settlement proposal. She did not file a notice of motion for sanctions. In 2014, the trial court issued a judgment covering a myriad of issues, including sanctions, spousal support, and other family law matters. As for the sanctions, the court concluded that the husband failed to promote settlement by: 1) not making a counter-offer; 2) engaging in excessive discovery regarding a particular asset; 3) asking for bank statements that he already had; 4) failing to provide information about certain benefits; 5) frustrating the wife’s attempts to withdraw money to buy a house; and 6) delaying the signing of a quitclaim deed. Under Section 271, an award of fees and costs – as a sanction – may only be imposed after notice to the party against whom the sanctions are sought. Here, the appeals court reversed the trial court’s award of sanctions, concluding that the wife’s pretrial statement of issues included only the “generic claim” that the husband did not cooperate and that he did not provide a settlement proposal. According to the court, the sanctions violated due process. The court agreed with the husband that under these facts, the award of sanctions could not be upheld. Here, there was no formal motion for sanctions, and the written notice specified only one ground, with other grounds to be alleged later during trial. The court pointed out that it is not acceptable to add grounds for sanctions as the trial progresses. Instead, there should be a clear and comprehensive statement of the grounds before trial so that the other party knows what to expect and how to respond. Although this is an unpublished opinion, the underlying reasoning could serve to inform court decisions in future cases. Courts clearly endeavor to deter parties from excessively litigating family law matters (among other issues). You are encouraged to reach out to a seasoned family law attorney to ensure that your financial and legal rights are protected. 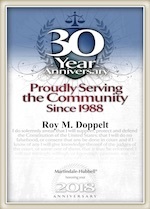 Roy M. Doppelt has been representing parties in divorce matters in Southern California for more than 20 years. Doppelt and Forney, APLC serves clients in Linda Vista, Encinitas, Scripps Ranch, San Diego, and throughout Southern California. For a free consultation with a dedicated and experienced family lawyer, contact Doppelt and Forney, APLC through the law firm’s website or give us a call toll-free at (800) ROY IS IT (769-4748).